Diplomatic tension between the US and Turkey over visa restrictions has escalated. 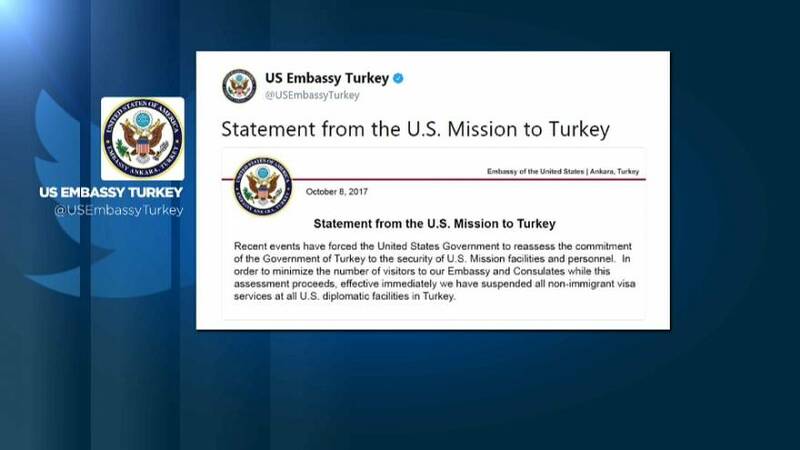 On Sunday, Washington announced it was suspending the processing of all non-immigrant visas in Turkey after Ankara issued detention warrants for US consulate workers it says have links to last year’s failed coup attempt. Within hours Turkey announced it was taking the same measures against U.S. citizens. The lira fell nearly two and a half percent with the main share index down nearly five percent. Ankara has been putting pressure on Washington for months to extradite US-based cleric Fethullah Gulen over his alleged role in the botched coup in July 2016. Turkish President Erdogan accuses Mr Gulen of instigating the unrest – a charge the cleric denies. Following the coup attempt, which was led by military officers, 40,000 people were arrested and 120,000 sacked or suspended. The row between the US and Turkey comes less than a month after US President Donald Trump said ties between the countries were the “closest as we’ve ever been”.